We've added the Metro Collecion by Cleaf. The Metro Collection is made up of 29 unique textures and 4 high gloss acrylic styles. Scratch and warp resistant these new products cost less than paint or stain and will transform any kitchen or bathroom into a showpiece! 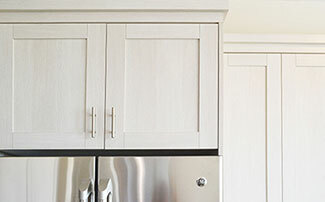 Combine the look of Cleaf with our top-notch casework for a kitchen that will last. Available in Shaker, Flat/Slab, and 'Sienna' style, Cleaf products are a hit with our customers! The two hottest textures are Carbone and Oregone Pine (Oregon Pine Shaker pictured) because they look great together in a two color kitchen and both are available in Shaker. Samples available for online ordering now! Casework options include: White Melamine, UV Cured Birch, or UV Cured Maple -with a LIFETIME limited warranty! We've added Luxe by Alvic. The Luxe Collection is made up of 15 unique high gloss and matte finish door styles, featuring Pearl Effect and MetalDeco styles. Lower cost than paint or stain makes your dream space affordable. Want to know more? Watch Alvic's video for the Supermatte and MetalDeco series here. 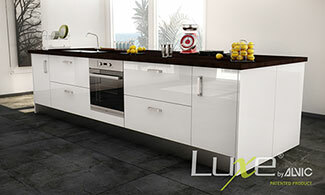 Would you like to see how Luxe can transform your space? Configure a space with Luxe here. Samples available for online ordering now! Casework options include: White Melamine, UV Cured Birch, or UV Cured Maple -with a LIFETIME limited warranty! Ready To Assemble cabinets are basically what the name implies: pre-made cabinets that ship to your home in a box. Everything you need to build the cabinet comes in one box; the only thing you need to supply are the knobs or pulls for the doors and drawers. 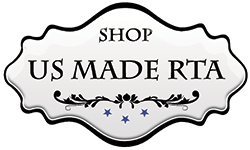 US RTA CABINETS manufactures RTA cabinets for both residential and commercial use. As you can see we are new to the internet, but not to cabinetry. We are experts in cabinet design, manufacturing, assembly, and installation and are working hard to bring you the quality content and information you expect when ordering cabinets online. We understand the entire remodelling process from concept to finishing touches -and not just the nuts and bolts of manufacturing cabinets! Our staff is not only made up of industry professionals with uber-geek level knowledge about cabinetry -but real, friendly people with families and homes of their own that are just as passionate about making your dream kitchen a reality as they are about their own homes.